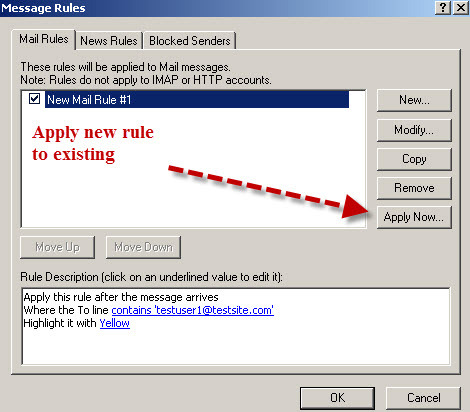 Messages Rules can used to better organise your email messages. Rules are applied to incoming messages usually for organisational purposes, and they only apply to POP3 accounts. Rules consist of a condition followed by an action if that condition is meet. The result would be that all messages from steve would be deleted. Where the message is from a specified account. combined as a logical AND or logical OR. meet for the action to be executed. If the conditions use OR then any one of the conditions being meet results in the specified action. Multiple message rules can be applied to a message. When this is the case you must be careful that the rules applied first do not interfere with the rules that would follow. make any rules that came after it meaningless, as the message would already have been deleted. A white list is a lit of contacts from who you wish to receive messages. 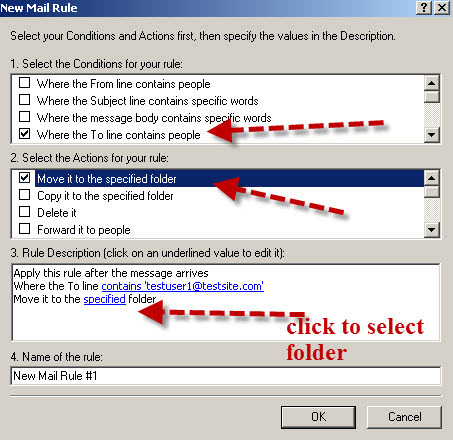 To create a white list for Outlook Express you create a rule that stops all further rule processing for the people on your white list. This means that any filtering rules that you implement later will not be processed for the people on your white list. 1. Add the addresses of the people you want to receive mail from to your address book. 3. Click on the New button at the upper right. 4. In the uppermost pane (pane 1), put a checkmark in the box Where the From line contains people. 5. Click on people in the bottom pane. 6. Add all the people you want, and then click OK.
7. In the middle pane (pane 2), check the box labelled Stop processing more rules. 8. Click on OK buttons until the windows are closed. You can configure a word filter to check for particular words and phrases in both the subject line and message body. Be very careful when deciding on what to filter as you could easily block legitimate email. Here we will create a simple filter to block messages that contain the dollars “$$$” as you often find it get rich quick emails. 2: On the right side, click the New button. 5: In Part 2, select the checkbox for move it to the specified folder, and then click the link for specified (shown highlighted) in Part 3. 8: Verify that all settings are correct and the rule is checked then click OK at the bottom. You have now setup a filter in that should move any e-mail with “$$$” in the subject line to a folder called SPAM. You should now review the contents of this folder to make sure everything has been configured correctly. If you are using outlook express to manage multiple POP3 mailboxes then it is useful to be able to distinguish between each mailbox. Moving mail to each mailbox into separate folders. Highlighting the messages with different colours. The rule screen shots below show the rule setup for testuser1. Rule- Highlight Message with a colour. Note: You would also need to configure a rule for the other recipient. When you create a new message rule it is often useful to apply the rule to messages that you have already received and not only to mew messages. To do that click on the Apply Now button before you OK the rule. You can choose how to apply the rule to a folder (inbox) and its sub folders. Click Apply now to confirm and then you can close the rule. 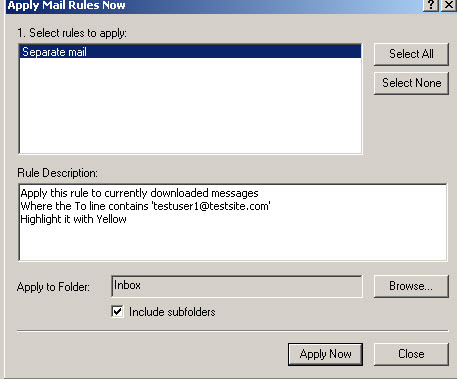 Message rules are a good way of automatically organising your email messages. They are applied on the client and only work with POP3 Mailboxes. 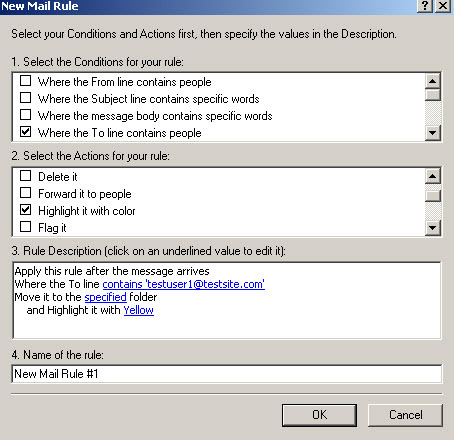 If you are using Outlook Express with an Email provider like Yahoo then they also provide rules/filters that are implemented on the server.